When I started writing this post a couple of months back, I was super excited to have finally found a recipe that the entire family would eat. Other than my red lentil and carrot soup with coconut, which I was getting so incredibly sick of, despite how delicious it is. Though I like pasta, I could easily live without it. So I can't say that I was thrilled at the idea of eating spaghetti so frequently. But the fact that my kids would eat it made me want to make this every single day, just to simplify my life. I had finally found a meal that would keep everyone happy and hence, quiet, at meal time. earlier photo - nothing short of a miracle!!! 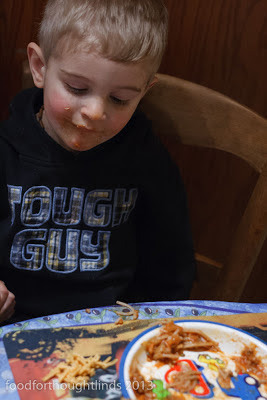 Not only did this meal keep my kids happy, but it also got some veggies into them. What could be better? This is a one-dish meal, since it has carbs, protein and vegetables all mixed together. Could life get any better????? This recipe is an adaptation from my mom's fantastic spaghetti sauce. 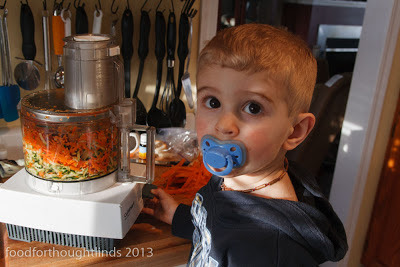 I modified it a bit to sneak in a few extra veggies and to change the texture to be more picky eater friendly. The recipe is not overly complicated, but there are a few steps involved and it then needs to simmer for a good hour. So this is certainly not something you are going to whip up once the kids get home from school. BUT, it makes quite a big batch and freezes wonderfully. I divide this into family-sized portions and load my freezer with it. 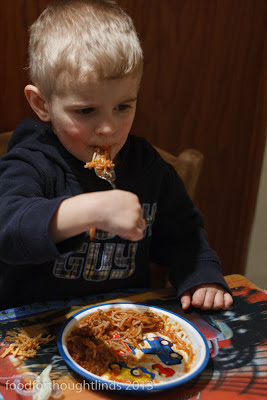 This is our go-to meal on nights when I've forgotten to take something out, as it tastes just as good defrosted as fresh, defrosts quickly in the microwave and, of course, the pasta only takes minutes to make. Now, there is certainly no guarantee that all picky eaters will eat this. In fact, I'm sure that a lot of resistant eaters out there will not. 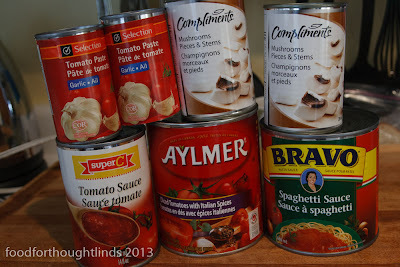 My kids have only very recently started mixing textures in their foods. And I suspect that had we taken a different approach to our children's feeding issues, they still might not be trying foods such as these. 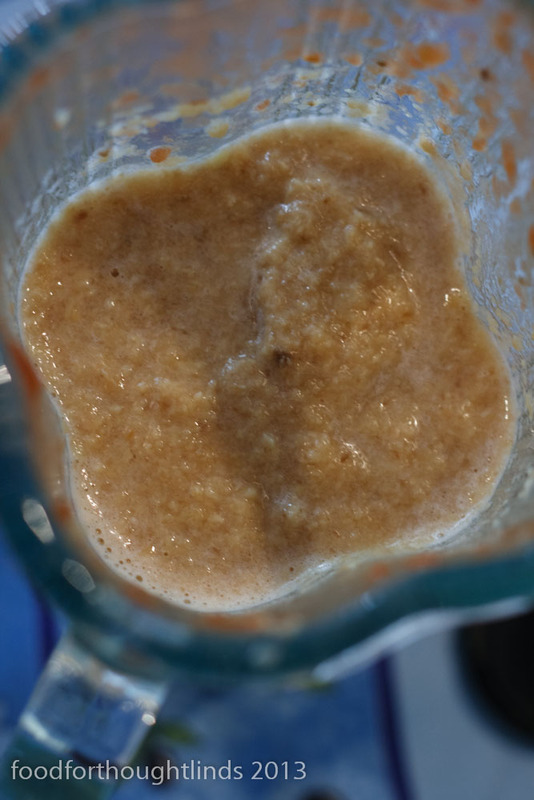 However, once your child is beginning to accept foods that mix different textures together, this recipe is a good one to try. 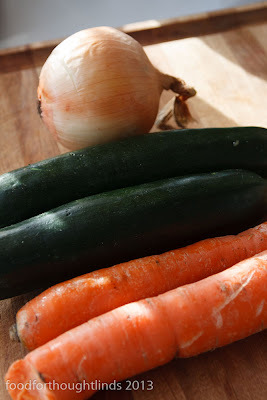 I should also address the idea of hiding vegetables in recipes. You want to be careful about doing this with very picky and resistant eaters. I do it now because my kids are too young to realize there is anything hidden. 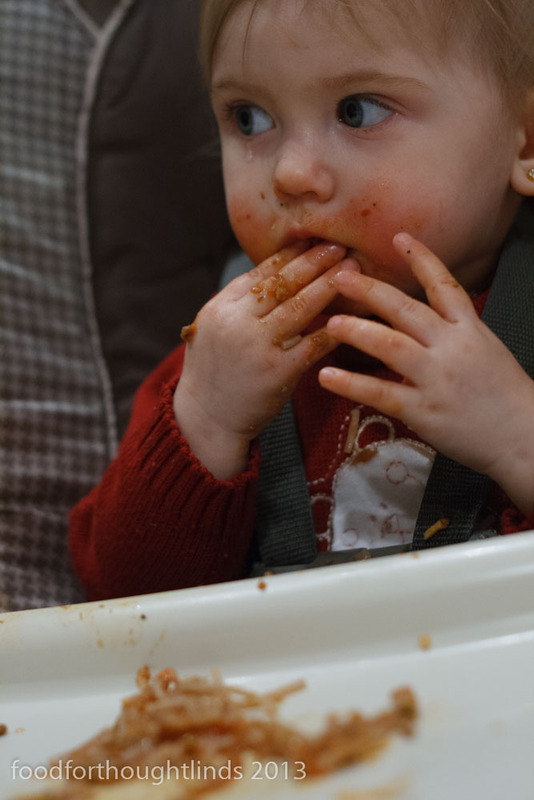 However, if your child is old enough to notice little green specks here and there, you're probably best to not hide foods. 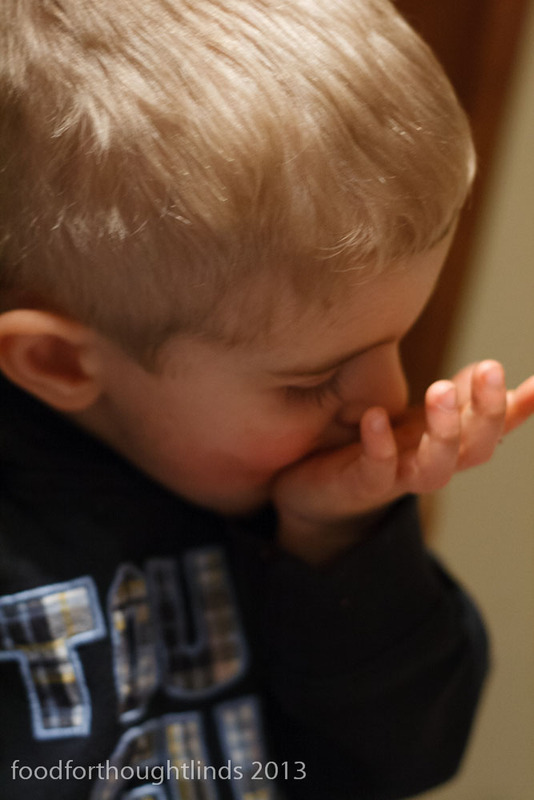 If your child finds food hidden in a dish where they are not expecting it, you are teaching them that they cannot trust what you tell them about what they are eating. This will only make a resistant eater even more cautious to put something new into his/her mouth. 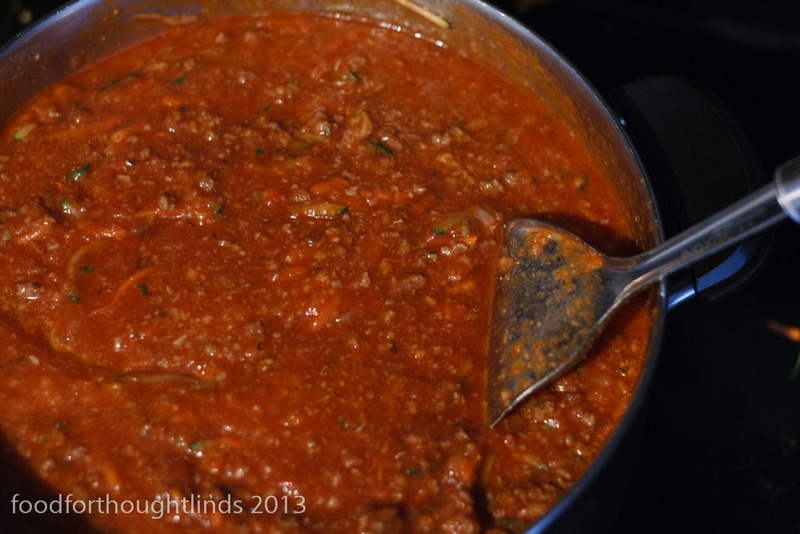 One last thing before I share the recipe - I actually prefer the original version, as I like the chunks in the sauce. However, I'll tolerate this thinner version as long as it keeps my kids eating! 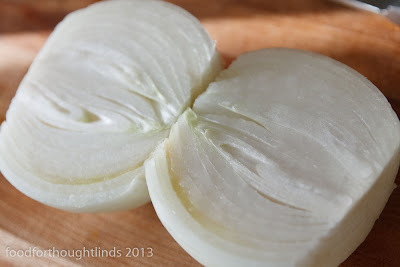 If you have no picky eaters at home, I'd recommend you check out the original recipe here. 1. 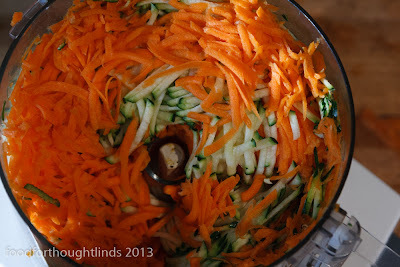 Using a food processor, chop the onion very finely and grate the zucchini and carrots. 2. 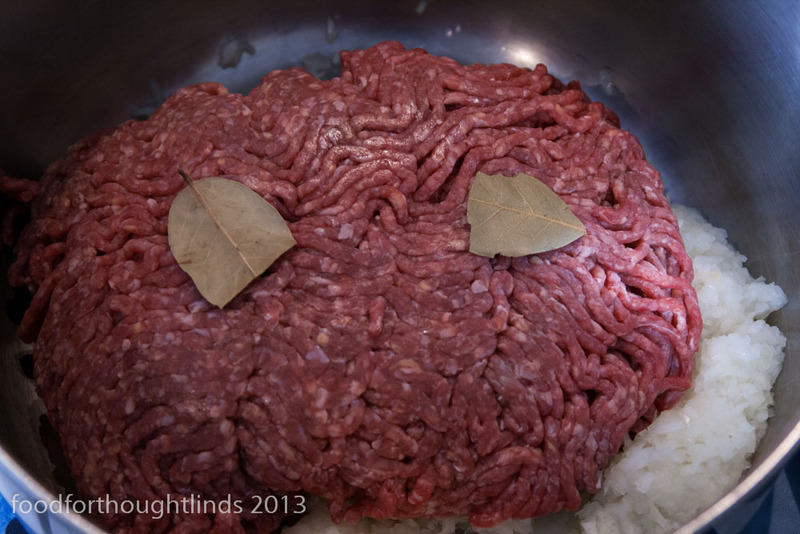 In a large pot (the largest one you have), cook the onion, ground beef and bay leaf until the beef for a few minutes. While cooking the ground beef, regularly break it down with a fork, so that it is broken into as small of pieces as possible. 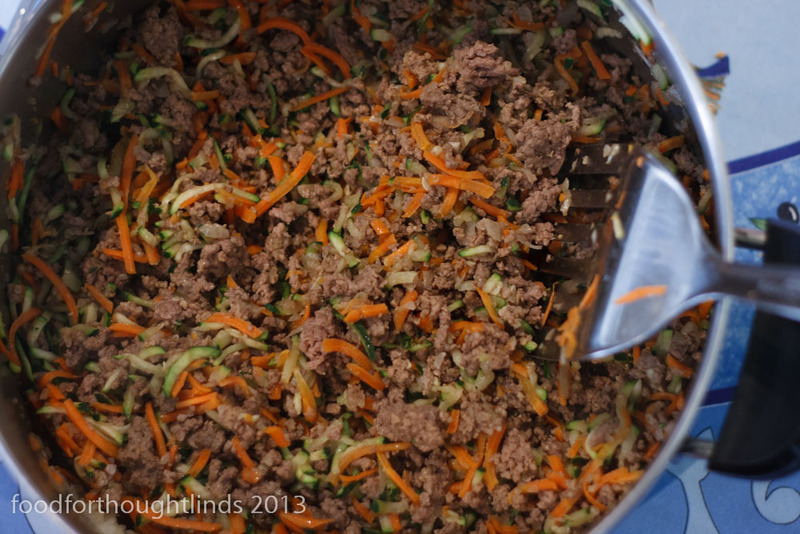 Add the grated zucchini and carrot and cook until softened and beef is cooked. Drain any excess fat. 3. 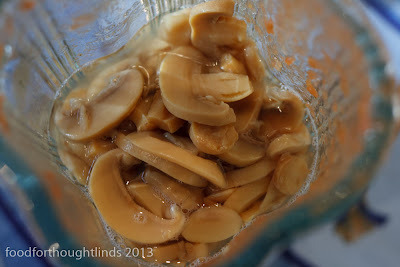 Purée the mushrooms (including juice) and juice in a blender until very fine. 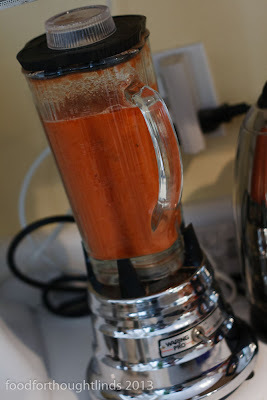 Also (separately if your blender is too small) blend the canned tomatoes. 4. 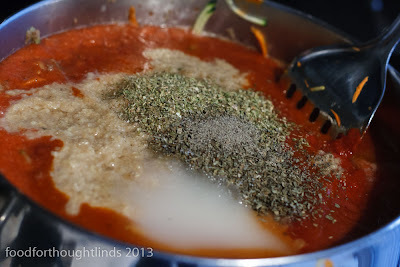 Add remaining ingredients and simmer steadily, uncovered for 1 1/2 hours, stirring frequently. 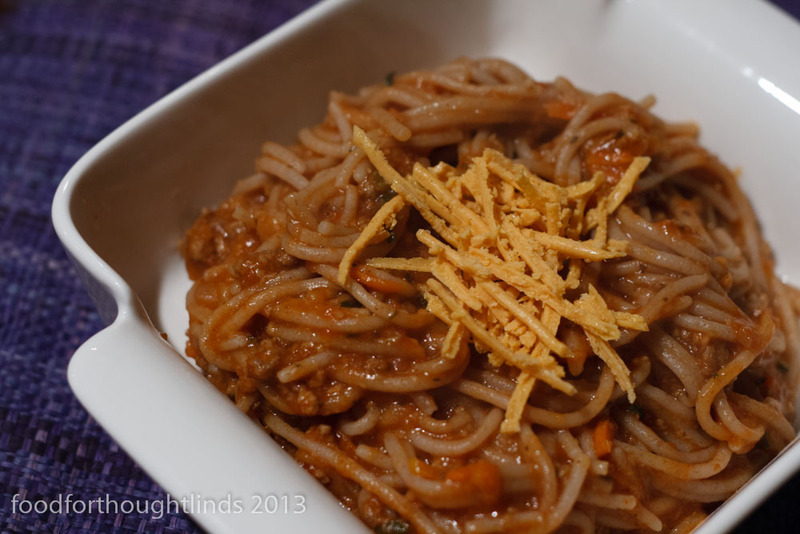 To keep this both gluten- and dairy-free, I omit the parmesan and serve it over quinoa pasta. 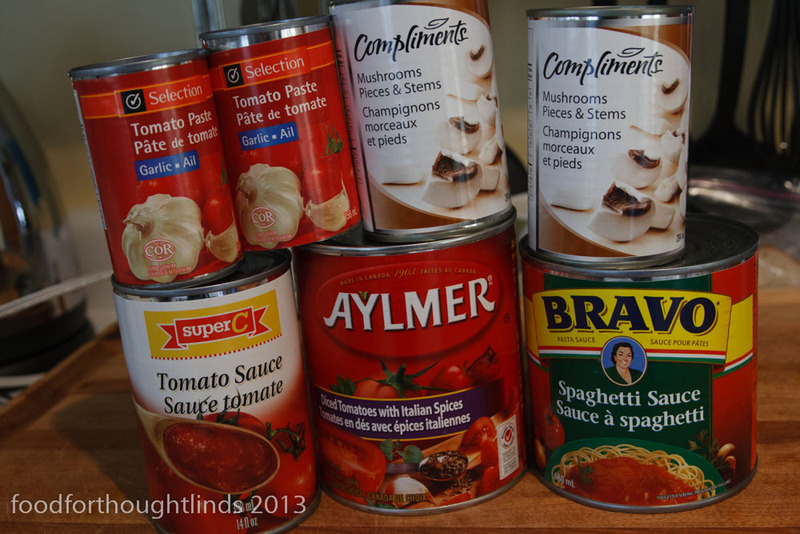 For a soy-free version, replace the Bravo spaghetti sauce with your favourite spaghetti sauce. 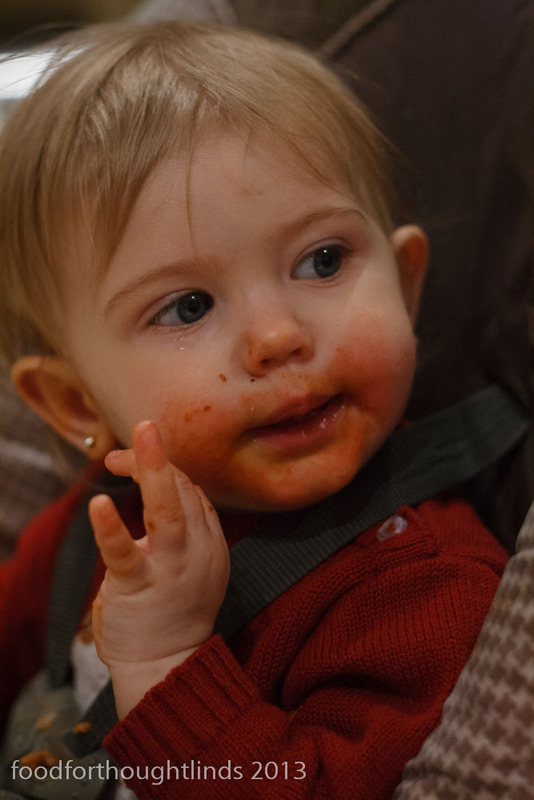 "If your child finds food hidden in a dish where they are not expecting it, you are teaching them that they cannot trust what you tell them about what they are eating." Apologies if you've already explained this elsewhere, but is there a rationale behind discussing ingredients with kids? I've never been one for 'sneaking' veg into my food either, but doesn't the discussion create yet another potential battleground? Does it not become another way of empowering your kids in dictating what the family eats? No apologies needed. 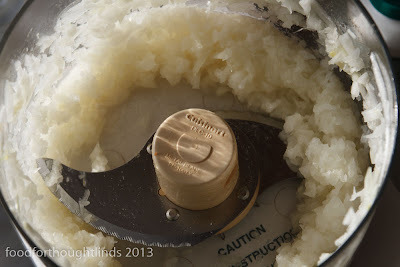 I probably should have been a bit more clear in what I was saying, for those who don't regularly follow my blog. The statement really only applies to children who are resistant eaters. 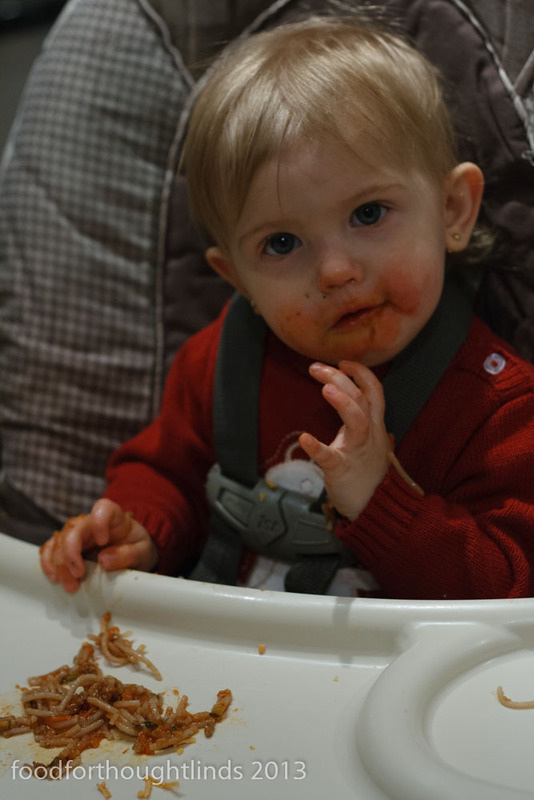 These kids have such difficulty accepting different foods that they are already very reluctant to try anything new. For many of these children, if they find a food hidden in something they do accept to eat, they will often stop eating that food at all. Even if they are starving. In the SOS Approach, the child does not dictate what the family eats. However, the parent also recognizes the the child's issues are not behavioural (the origin of very picky eating is typically not behavioural, but rather a physical problem). So the parent needs to read the child's signals and understand that the child cannot yet handle certain foods - be it because they have yet to develop proper chewing skills, cannot handle the texture of foods, have an intolerance to that food, etc. 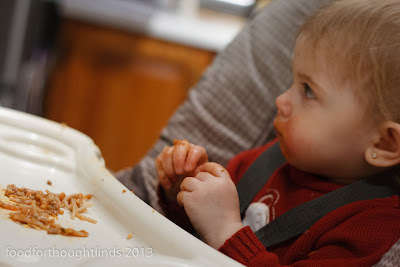 The parent always serves at least one food that the child accepts to eat at every meal and then lets the child entirely decide what to eat with no pressure. We've seen very considerable results with my kids using this approach.